In the previous post of this indefinitely long series, I explained how Optotraffic's Automated Speed Enforcement system can report a car to be traveling 52 miles per hour when in fact the car is actually traveling at 35 miles per hour. 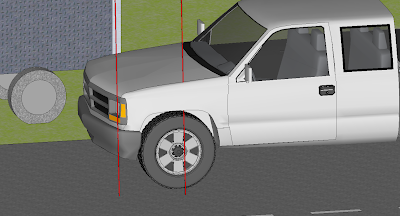 This particular error is created when the lasers are not parallel to the road and strike the near side of the car rather than the centerline. 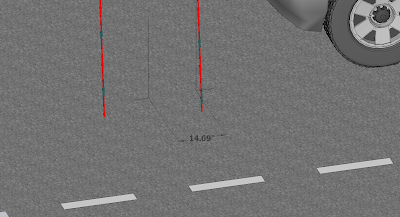 In this post, I discuss a similar error, this one caused when the lasers nearly overshoot (rather than nearly undershoot) the car. 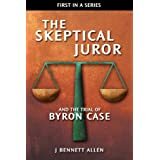 The potential error in this case is even greater than the previous case. 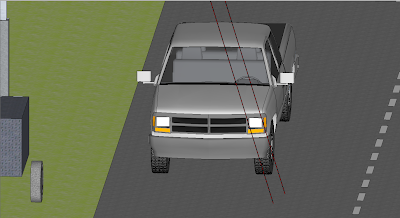 The lasers are more likely to overshoot the vehicle when the vehicle is passing the laser system in the nearest lane, as shown below. 1. The laser beams are not properly aligned. 2. The cart is located too near the road. 3. The vehicle is not on the centerline of the road. 4. The cart is tilted away from the road. 5. The wind bends the 32' tower away from the road. 6. The lane is narrower than usual. Any behavior that causes the laser beams to strike the vehicle beyond the centerline increases the chance that the system will overpredict the vehicle speed due to an overshoot. 2. The laser platform is yawed relative to the 32' tower. 3. The 32' tower is twisted due to wind or cable tension. 4. The cart is not parked parallel to the road. 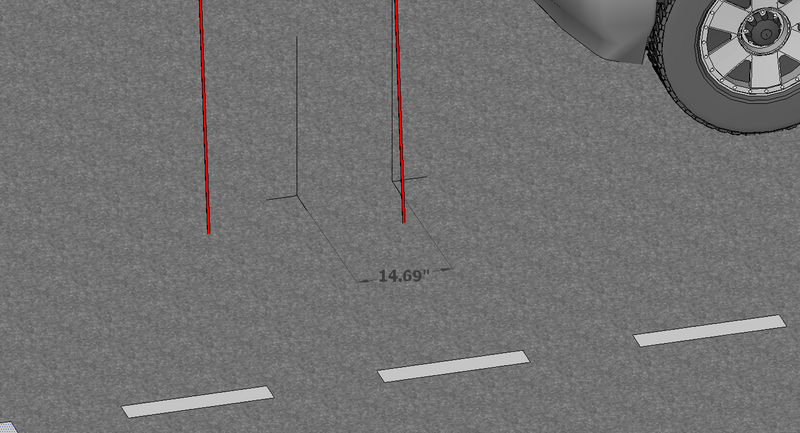 In this example, the cart is so close to the road that the beams hit the road 2 feet beyond the lane centerline. 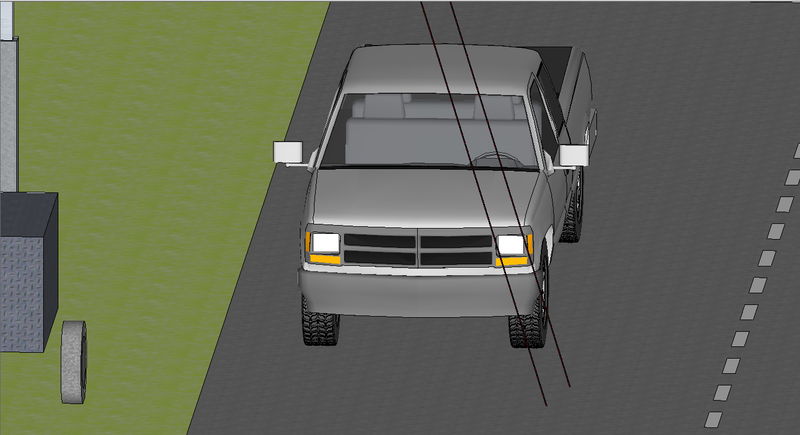 The pickup is traveling 8 inches from the lane centerline. The beams are yawed 10 degrees such that the first beam to strike the vehicle overshoots more than the second. 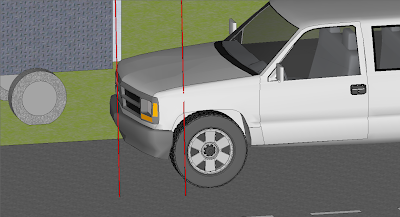 Speaking of the first beam, here's where it strikes the pickup. In this example, the beams are 29.25 inches apart. The truck, however will travel less than 29.25 inches before the second beam hits the truck, because the second beam will strike the truck closer to its front end, as shown below. Instead of first contacting the upper portion of the fender, as did the first beam, the second beam first contacts the outer edge of the bumper. The distance the truck traveled between first and second beams was foreshortened by the distance between the intial contact points of the two beams. To show that distance, I dropped a vertical line from each of the contact points, backed the pickup up, and measured the distance between the two vertical lines. Here you go. I think that might result in a substantial error. Let's check. The actual distance traveled between beam contacts will be 29.25" - 14.69" = 14.56". The system will assume the distance traveled was 29.25 inches. The speed calculation will be off by a factor of 29.25/14.56 = 2. Assuming an upstanding citizen passed beneath the Space Sigma Optotraffic DLS-10S Automated Speed Enforcement system under the conditions just described, and assuming that upstanding citizen was traveling at 35 miles per hour, that upstanding citizen would receive a speeding ticket in the mail for traveling 70 miles per hour. TUC (the upstanding citizen) would be rightfully peeved, knowing that he or she never traveled anywhere near 70 miles per hour down that stretch of road. TUC might decide to fight the ticket rather than subserviently pay the $40 ticket by mail. 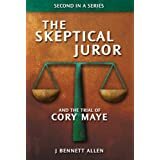 TUC would decide to take a half day off work (assuming he or she was still employed in this economy) and sit through hours in a courtroom until the State was ready to hear his or her case. TUC might explain that he/she lives in the area, knows exactly where the piece of crap sophisticated laser system is parked, and explains that he/she would never travel 70 mph on that road even if the system wasn't there. The representative from Optotraffic would explain to the judge their sophisticated system uses lasers that are calibrated against GPS beam pulses every single day. 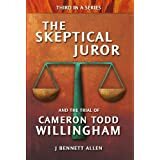 The judge would bang his gavel against that really cool gavel banging thing, and justice would be administered. TUC would be charged $40 for the ticket, and $44 for bothering the court. “Optotraffic is in the business of helping to protect public safety. Our company’s public trust and reputation are built entirely on the precision and highest degree of accuracy of our systems. We are proud that our calibration and testing are trusted and have been verified by the many Maryland municipalities that use our systems." For those of you who believe I must be three-dimensionally delusional when I suggest that the system may miscalculate the speed by a factor of 2, consider this article from The Washington Examiner, excerpted below. A Maryland speed camera contractor is investigating whether its cameras have been miscalculating the speeds of large vehicles in Prince George’s County. Lanham-based Optotraffic is analyzing a dozen citations that recorded buses and trucks exceeding the speed limit by more than 25 mph, Optotraffic CEO Marcos Sirota told The Washington Examiner. Sirota began investigating citations when a camera on Rhode Island Avenue and 38th Street in Brentwood caught bus driver Kathleen LaFortune driving 58 mph in a 25 mph zone. Another driver is contesting a ticket that says his bus barrelled 78 mph through a 35 mph zone on Bladensburg Road — just one-half mile from where LaFortune was ticketed. “These tickets are just exploding,” said Rick Hilmer, fleet management administrator. Hilmer said his office — which collects county bus drivers’ tickets—is averaging 30 citations a day. Susan Hubbard, spokeswoman for Prince George’s Department of Public Works and Transportation, said she could not imagine a bus nearing 60 mph where [the unfortunate] LaFortune was ticketed. But [the unfortunate] LaFortune could not contest her July 28 ticket. She [the unfortunate LaFortunate] says she was not notified of the violation until Aug. 26, seven days past the deadline for requesting a court date. Fleet management did not receive the ticket from Brentwood officials until Aug. 16, Hilmer said. State law requires camera operators to mail citations within two weeks of the violation. Brentwood Police Chief David Risik did not return The Examiner’s calls to confirm the ticket was mailed within the legal time frame. [The unfortunate] LaFortune’s employer, Veolia Transportation, received the ticket Aug. 20, Hubbard said, and LaFortune said another six days passed before Veolia notified her of the violation. Veolia then suspended [the exceptionally unfortunate] LaFortune on Aug. 27 without pay, enrolled her in a three-day “refresher” training course and warned of termination if she gets another ticket, according to an internal notice from the company’s assistant general manager. So Optotraffic strikes again, this time getting upstanding citizen Kathleen LaFortune suspended without pay. Let's see what President/CEO Markos Sirota has to say about that. “For both the municipalities and for this respected company, our collective commitment to public safety is unyielding and will never be compromised for any reason."